It was the ISIS' bloodiest defeat to date in Syria. But now, three months since Kobane was liberated, tens of thousands of its residents are still stranded in Turkey, reluctant to return to a wasteland of collapsed buildings and at a loss as to how and where to rebuild their lives. The Kurdish town on the Turkish-Syrian border is still a haunting, apocalyptic vista of hollowed out facades and streets littered with unexploded ordnance - a testimony to the massive price that came with the victory over ISIS. There is no electricity or clean water, nor any immediate plans to restore basic services and start rebuilding. While grateful for the U.S. airstrikes that helped turn the tide in favor of the Kobane fighters and drive out ISIS militants, residents say their wretched situation underscores the lack of any serious follow-up by the international community in its war against ISIS. “First, Islamic State fighters were holed up in our home and then the American planes bombed it,” said Sabah Khalil, pointing from across the border in Suruc, Turkey, to where her family house in Kobane is now a pile of crumpled cement. “Who is going to help us rebuild? That’s what everyone is asking,” she added, sitting on a stone outside her tent, soaking in the spring sun as children in tattered shoes played nearby. For four ferocious months, Kobane was the focus of the international media after ISIS militants barreled into the town and surrounding villages, triggering an exodus of some 300,000 residents who poured across the border into Turkey. The battle for Kobane became the centerpiece of the campaign against ISIS. Dozens of TV crews flocked to the Turkish side of the border and from a hill, trained their cameras on the besieged town, recording plumes of smoke rising from explosions as the U.S.-led coalition pounded ISIS hideouts inside the town. In late January, the Kurdish fighters finally ousted ISIS from the town - a significant victory for both the Kurds and the U.S.-led coalition. For ISIS, which by some estimates lost around 2,000 fighters in Kobane, it was a defeat that punctured the group’s image and sapped morale. But the price was daunting. 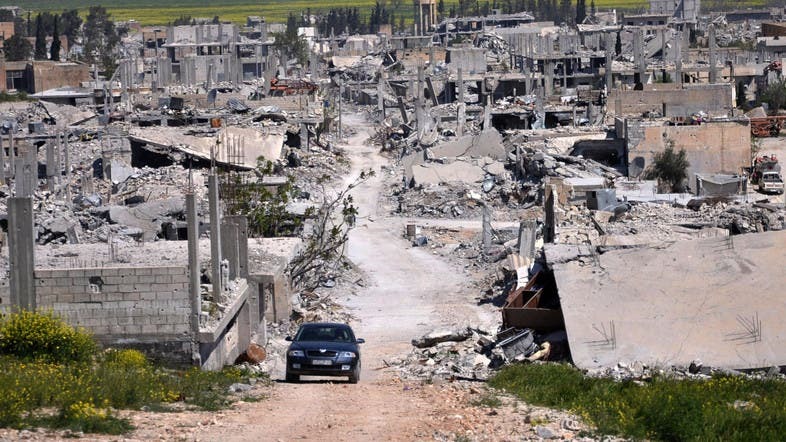 Today more than 70 percent of Kobane lies in ruins. More than 560 Kurdish fighters died in the battles. About 70,000 of the refugees have returned to the town and surrounding areas, some only to pitch tents outside their destroyed homes, according to Aisha Afandi, co-chair of the Kurdish Democratic Union Party, or PYD. With no outside help, the Kurdish fighters use primitive tools to dismantle mines and booby traps left behind by IS militants. The rotting bodies of dead fighters are still trapped under the rubble, and as the weather gets warmer, there are concerns of spreading disease. Afandi said an appeal for international donors and Kurdish communities everywhere will be launched at a Kurdish conference on Kobane, due May 2 in the mainly Kurdish-populated city of Diyarbakir in Turkey. There are also plans to transform parts of the town center into a museum, she added. “It is important for future generations to remember the history that was made here,” she said over the telephone from Kobane. Three times a week, when Turkish officials open the gate at the Mursitpinar border crossing for a few hours, refugees trickle back into Kobane. On a recent day, a few dozen people carrying suitcases and bags were at the gate, waiting to cross. Vans loaded with mattresses and other belongings were lined up on a dirt road. At the nearby Arin Mirxan camp in Suruc, named after a female Kurdish fighter in Kobane who is said to have carried out a suicide bombing against IS militants in October, the hopelessness is on full display. Ali Hussein and his mother Zalikha Qader sit next to each other in the camp, eating roasted pumpkin seeds and wiling the time away. In nearby “Tent Number 3,” Shahin Tamo, 21, takes care of his 7-year-old brother Sarwan, a skeletal child with large eyes who suffers from a serious neurological condition. They are here with their parents, two brothers and two sisters. Their Kobane home was looted and burnt. At least once a day, camp residents go out to the main street to greet a procession bringing in fallen Kurdish fighters from inside Syria. The bodies, in simple wooden coffins draped in the Kurdish red, white and green-color flag, are the tragic toll of still ongoing fighting back home between the main Kurdish militia known as the People’s Protection Units, or YPG, and IS militants in areas around Kobane. “Your blood will not go in vain!” the refugees shouted in Kurdish.